Brilliant and devastating and incredibly beautiful. A high-octane paranoia deranges a writer and fuels a dangerous plan to return home to El Salvador at the tail end of its long civil war. 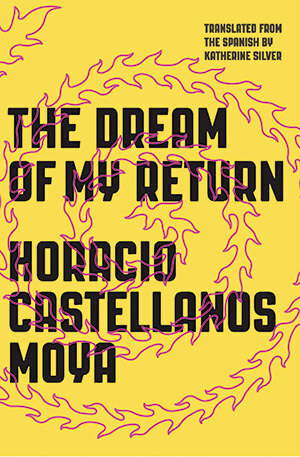 High-octane paranoia deranges a writer and fuels a dangerous plan to return home at the tail end of El Salvador’s long civil war. Is the plan a dream or a nightmare? Is he courageous, foolhardy, or just plain dumb? Is the bubbling brew of horrors and threats actual or imagined? After he seeks relief for liver pain through hypnosis (while drinking more than ever, despite the treatments), his few impulse-control mechanisms rapidly dissolve, and reality only rarely intrudes on his cogitations. Harebrained murder plots, half-mad arguments, hysterical rants: the narrative escalates at a maniacal pace, infused with Horacio Castellanos Moya’s uniquely outlandish and acerbic sense of humor. A welcome, eye-opening addition to this new literature of the Latin American nightmare.